Each year, many of Jumpstart’s members across the country follow the lead of Dr. Martin Luther King, Jr.’s civil rights work by dedicating the day to serving their community. MLK Day of Service, sponsored by the Corporation for National & Community Service (CNCS), is centered around volunteer projects that address some of the greatest needs in our local communities. Some of these activities include writing postcards to senior citizens in the surrounding area, assembling care packages for US troops, putting together welcome signs for families transitioning out of homelessness, packing bag lunches for a local food pantry, collaborating in community art projects, and much more. In past years, we’ve seen Jumpstart members celebrate the day in and out of the classroom. In Berkeley, Jumpstart USC worked with schools in Southern California to help develop a deeper partnership with the surrounding communities through collaborative service. 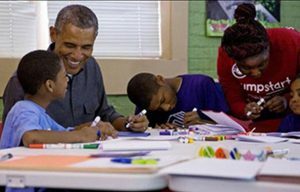 In Washington, D.C., three lucky Jumpstart members had the incredible opportunity to volunteer alongside then-President Barack Obama at the Boys & Girls Club of Greater Washington. And each year in classrooms around the country, Jumpstart members lead activities with preschoolers designed to teach them about the history of MLK and the messages of his work. If you have the day off from work, we encourage you to take part in a community service projects in your own neighborhood. You can join this national movement and find volunteer events happening near you by visiting CNCS’s MLK Day of Service website.